Devoted Quilter: Celebrating with a Free Quilt Pattern! Devoted Quilter is 5 years old today!! I can't believe how much has changed because of this blog. I never could have dreamed five years ago that I'd be publishing patterns in magazines or that I'd have my own pattern shop. I wouldn't be an ambassador for Island Batik if I hadn't started blogging, and I probably wouldn't have a to-make list that stretches from now into eternity! How is it that the more I make, the more I still want to make? Most of all, though, I wouldn't have quilting friends scattered all over the world if I hadn't taken the plunge and hit publish on that first post. Thank you all for joining me on this adventure! I love being a part of this community! (And yes, I know that's way too many exclamation points, but sometimes you just have to let all the excitement out 😊) I have loved the IG chats, the inspiration from all of your beautiful makes, time spent reading about your daily lives and just everything that goes with making new friends. To celebrate my blogiversary this year, I have a new free pattern to share. I had hoped it would be a finished quilt, but that didn't happen. It's basted, but not yet quilted, so a quilt top will have to do for now. It is 60" x 72". I'm calling it Indecisive because the blocks can't decide if they want to be vertical or horizontal, lol. The block was inspired by tire tracks on a snow covered road last winter. 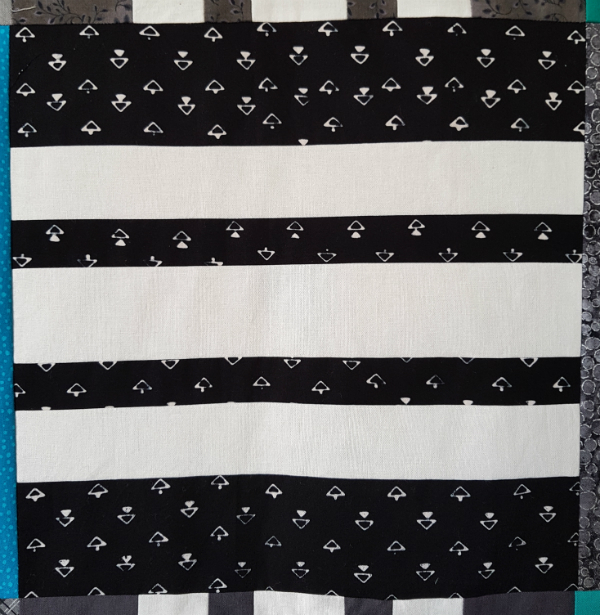 It's a lot like a traditional basket weave block, but I made a subtle change, making the middle white strip in each block wider than the two outside white strips. It's hard to see in the pictures, though it's a little more obvious in a close-up of one block, especially if you look at the very top of the picture where there's just a smidge of the block above visible. You can download the free PDF pattern from my Payhip shop, with many, many thanks for all of your support and friendship these past five years. And if you've never signed up for The Bulletin, my monthly newsletter, I invite you to do that too. You'll even get another free pattern for signing up! 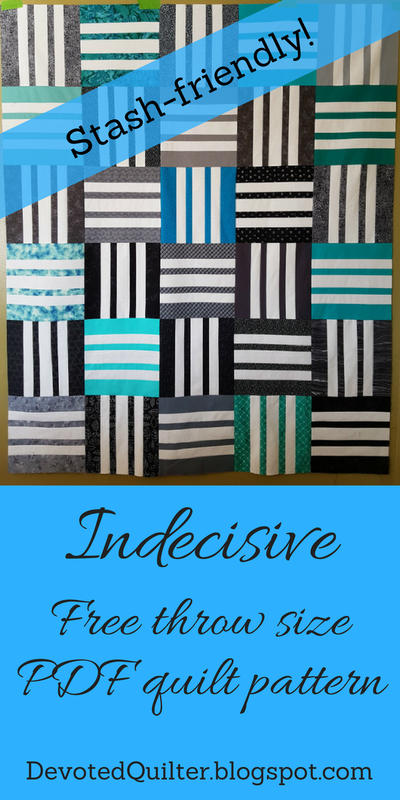 If you make Indecisive, I'd love to see it, so be sure to tag me on IG (@devotedquilter) or FB (@devotedquilterdesigns) or send pictures to devotedquilter at gmail dot com. Congratulations on your 5 year anniversary. Good wishes for a successful 5 more years (at least)! Congratulations on your 5 year blog-iversary!!! Thank you for sharing your thoughts, family and faith with the world and your quilts. Congratulations. Thank you for sharing such lovely creations. Congrats!! I'm so glad I found your blog. It's been great following you and getting to know you. Here's to the next five years. Congrats on your 5 year anniversary!! That's awesome! 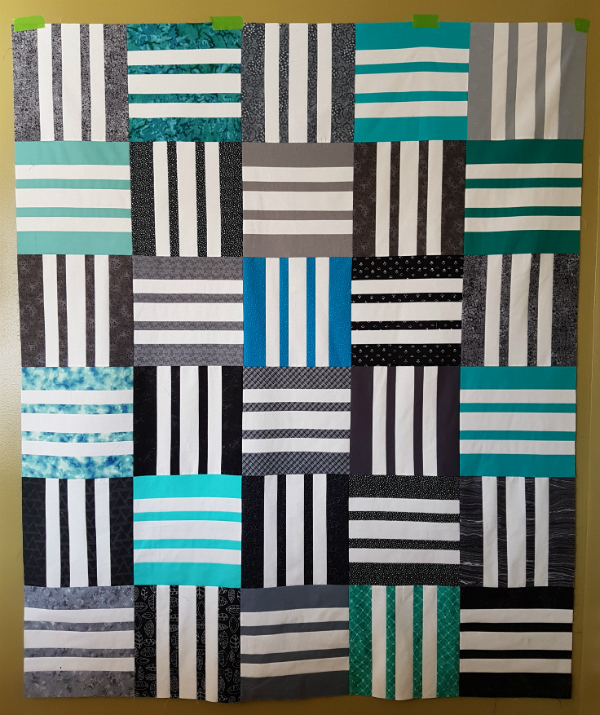 I also love the quilt pattern, so much fun to do some great strip piecing! Thank you for the pattern. I've always liked those quilts that have a basket weave appearance.